Having trouble with your new iPhone 6? Worry no more, contact iRepairMan and get all your iPhone problems sorted out. Before introducing ourselves, let us first tell you a bit about iPhone 6. 5- Software with iOS 8 which is upgradable to iOS 8.1 and beyond. 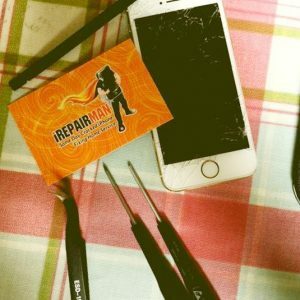 iRepairMan is a special phone repairing service provider, where our experienced, DBS cleared technicians to repair your phones on the same day in front of your eyes, at either your house, office or any coffee shop wherever you want. 2: In an hour, our certified technician who is assigned your area will contact you to arrange the repair phone session according to your convenience. 3: On scheduled time and place our iTech will come by and within 20-30 minutes, your phone will be fixed in front of you. 4: Finally, you can pay our representative on the spot with cash or via card. We also give one year warranty with our service, something which is hardly provided elsewhere. Our aim is to relieve you of the troubles of getting your phones improperly repaired by amateurs. Quality, cost-effectiveness and saving time, these are some of the factors that we keep in mind while providing our services. We repair all types of phones especially all generations of iPhones. We provide service throughout London; our technicians can be reached from any part of the city. Our customers have shown satisfaction with our work and their reviews can be read on our website. For further queries send us an email at [email protected] or call or text us on 07506 011774. Our efficient iTech will contact you within an hour for appointment to come at your place. iRepairMan Sales & Customer Service Team!